“How do you make a grain marketing decision?” is a question I often ask growers. I receive all sorts of answers. Daniel Kahneman, a psychologist, won a Nobel Peace Prize in Economics for his work on decision making. He describes the mind as having two systems of thinking which affects decision making. System 1 is fast, automatic, intuitive, emotional and takes little effort. System 2 takes more effort, concentration and is more logical. Both systems are useful. We do need to make quick decisions based on intuition and memory. We also need to slow down and weigh the facts when making a decision. System 1 is fast and System 2 is slow. Kahneman explains that System 2 can override System 1 and make more logical decision but it takes self-control. In grain marketing, folks talk about making decisions on profitability or based on the “numbers.” This is classic System 2 thinking and decision making. Our friend who makes decisions with his “gut” is using System 1 thinking- it’s fast and intuitive. Maybe his intuition is based on years of experience or learning from previous successes/failures? Neither system is wrong and both are necessary to navigate life. Tools like Harvest Profit aid in logical and data-driven decisions. Tools that slow a decision maker down and help him/her make decisions can be very useful and profitable. Grain marketing is difficult because yields can be uncertain and the market is unpredictable and volatile. Kahneman observes and cautions trusting intuitions in the absence of stable environments. Are unpredictable and volatile grain markets stable environments? Here are 4 ways to incorporate logical System 2 methods into to your grain market decisions. View the farm broadly. Think of the whole crop when making a decision. Imagine the entire crop as a whole pie. When making a grain decision a small piece of the pie is filled in. A decision to market 20% of production is just that, 20% of the pie. There is still 80% of the pie unsold. When one takes the long view over several crop years or even a career: a 20% sale of one commodity, in one crop year, is put into proper perspective. Cost of production can be a known number of a farm. It will take effort to gather all the information but it can be done. 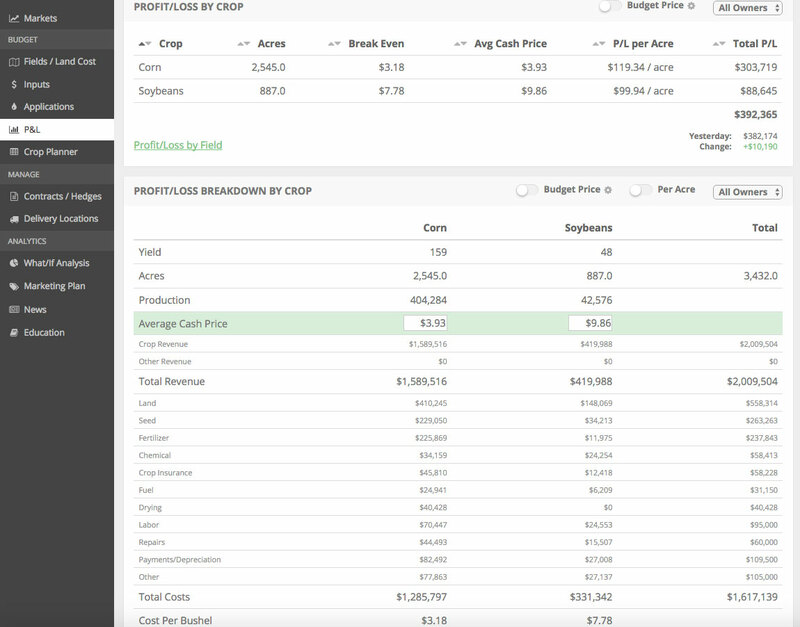 Use Harvest Profit to break down a per field profit-and-loss to move beyond a grain marketing decision into farm business decisions. Gather the average production history (APH) for the last 5 years. It is a proven number. The APH doesn’t guarantee what a farm will yield this year but a farm can make decisions based on a percentage of that APH and adjust throughout the growing year. What if the farm marketed 20% of its average production history? If the farm produced a ½ crop it would be 40% marketed. How would that feel? Get comfortable with a less than ideal production scenario. If a farm markets like it will raise zero bushels it may miss the best times to sell grain during the growing season. There is an interesting paradox in crop farming: aiming to raise 280/acre bushel corn with the tendency to market like one will raise zero. Sell or Place a firm offer(s) on the percentage of production the farm is comfortable with: at the desired price; above the cost of production; at the delivery location or broker of choice. If you wait until peak growing season the “hot” and “dry” chatter may talk you out of making the sale. A journal of these “Why” entries will make a great legacy to past down to the next generation of decision makers. One thing is certain: The market will change after you make a decision. The more one uses System 2 logic in the decision making process the less regret one will experience when the market changes. I’ve also observed many “gut” System 1 decisions. Many turn out fine when one views the farm broadly. Avoiding All or Nothing Decisions, Calculating the Knowns, Setting the Target, and Knowing Why are just four of many ways I observe farms can work System 2 logic into their grain marketing programs. I find Kahneman’s research fascinating. What about you? There is more of Kahneman’s science I aim to unpack and apply to real grain marketing methods it future writings. Our man from the beginning who makes decisions on “gut” or System 1 thinking: He is still in business. He also uses more logic in his business than he leads on. The source used for this Article: “Thinking, Fast and Slow” by Daniel Kahneman. Farrar, Straus and Giroux. New York, New York. 2013.